Calderdale Green Jobs Alliance – we need one! Calderdale Green Jobs Alliance is a group doesn’t exist – at least not as far as I know- but it could if people want to make it happen. The idea’s inspired by the East London Green Jobs Alliance. If you’re interested in turning this idea into practical action, please say how you’d like to go about this on the Green Jobs Forum, or else in the comments box at the bottom of this page. 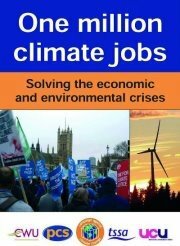 The Alliance for Jobs and Climate has advice on how to set up Local Jobs and Climate Alliances. These look fine but they seem more general than the East London Green Jobs Alliance, which looks as if it does what it says on the tin. Green jobs and skills for Calderdale are vital, particularly since 18 per cent of households in Calderdale are on the edge of poverty and if the economy gets any worse they’ll be forced over the edge. Not to mention the fact that Calderdale and UK carbon emissions continue to rise, according to the latest (August 2012) statistics from the Department of Energy and Climate Change. The ConDems’ idea of investing in infrastructure to help revive the economy is to start a massive new roadbuilding programme – how mad is that? Increased road traffic will increase carbon emissions. Much better to invest in green infrastructure. And a recent study by the economic consultancy Cambridge Econometrics found that using carbon tax to subsidise a national programme of home energy efficiency retrofits, as advocated by the Energy Bill Revolution campaign, could create more jobs and growth than any comparable Government spending programme or tax break. It could also eliminate Fuel Poverty. So here is green jobs and skills news. The next meeting of the national Campaign Against Climate Change Trade Union group will take place in Manchester on Saturday 26 January from 12pm. This group is calling for the creation of One Million Green Jobs. The venue is the Methodist Central Hall, Oldham Street. This is about 10 minutes walk from Manchester Piccadilly Rail Station. Here’s an account of the MIllion Climate Jobs Caravan that toured the country in May 2012.